In my previous post, I discussed the overpriced cost of buying beverages while out at restaurants. Here's a helpful suggestion for those who long for a flavorful drink with dinner but don't want to pay for it. Pictured on the left is a cheapo make-shift lemonade, available at a restaurant near you. Here's what to do. 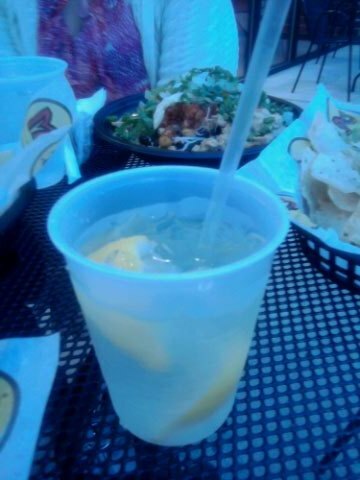 Ask for a glass of water and some extra lemons. Grab some sugar on the table and get to work. Squeeze the heck out of the lemons and dump them in your water, then add a packet of sugar. Stir well and Walah! You have just created your own free lemonade. If you would have ordered it, you would have paid around $2, but this one costs you zippo. I discovered this frugal recipe as a result of having dinner and my dad made this concoction at the dinner table at a restaurant. I was a bit embarrassed, ashamed even that he would ever do such a thing. I felt like everyone was watching. Surely someone would tell him "You can't do that!" But, no one did and eventually I got so used to it, I started following in his footsteps. I do this almost every time I go out. It just goes to show that sometimes becoming more like your parents isn't such a bad thing...or depending on how you view this, maybe it is. Does anyone else out there make these? Would you ever?